It's that time of the year again, HWBOT Country Cup 2017 is upon us and we are about to find out who the best overclocking nation in the world is very soon. If you haven't seen these overclocking competitions in the past, it's basically the world cup of overclocking. Nations get together and complete in numerous stages set by HWBOT. There are six stages this year ranging from SuperPi, Cinebench, X265, GPUPI, 3DMARK11 and 3DMARK Time Spy. It's a mixed bag of 2D and 3D stages with some even dedicated to the latest AMD platforms. The top10 leaderboard is looking interesting at this point. 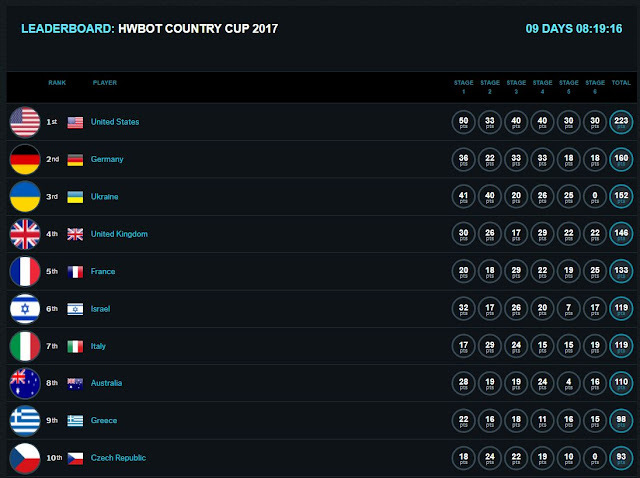 USA is in the lead and we can see last year's winner (Greece) and running up (Australia) down in 9th and 8th places respectively. These competitions are tend to change rankings considerable, particularly near the end of each stage but it's good to see a nice mix of countries. Germany is always a bit performer as is France. Good to see Ukraine and UK pushing up rankings. I wonder if Indonesia will make a play this year as they always have a strong showing. 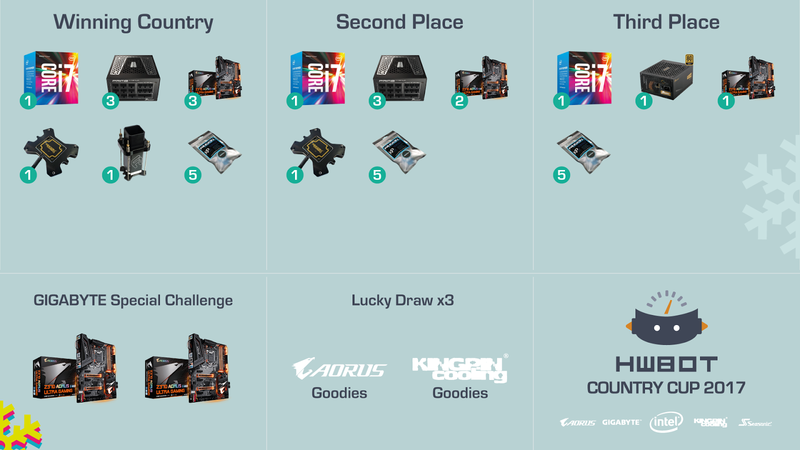 Prizes never disappoint and this year we see some awesome GIGABYTE Z370 boards up for grabs, alongside Intel CPUs, Kingpin cooling and Seasonic. Keep an eye on the competiton via this link. First stage is due in about 9 days. It should get the party started: http://oc-esports.io/#!/round/country_cup_2017!